The hatchery is located at Beaver Meadows farm, the property of Edgar Smith. Until very recently the hatchery was deep in the woods on the farm, but that has now been clearcut and the hatchery is easily seen from the road. THis year we have seen 30 inches of rain in October and November , and fish have been able to get up into small streams and creeks that they have not been able to reach for many years. 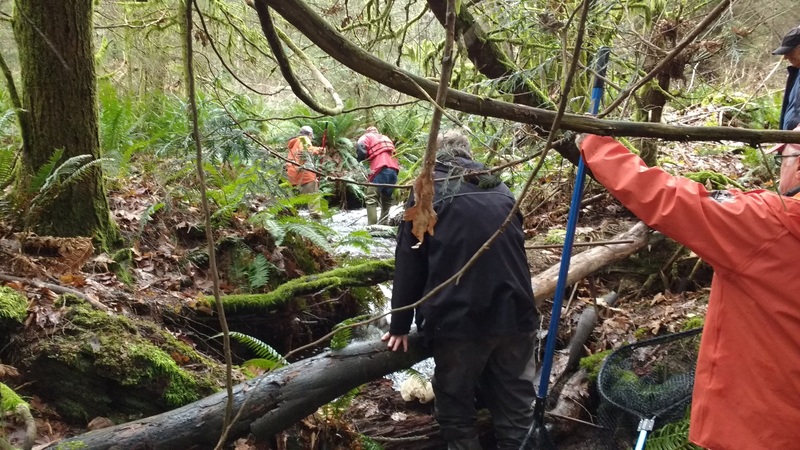 ​The two male coho below were found in a ditch dug by The Raven group, who own a large tract of woodland in Block 71. Unfortunately the ditch is dug through a predominantly clay soil, with little gravel, which makes it really difficult for the fish to spawn. The photo below shows just how small the streams are that coho, in particular, will navigate in their urge to spawn and procreate. The map above illustrates the position of Beaver Meadows farm. The brief video above demonstrates the volume of water being released by BC Hydro to avoid Comox Lake overflowing after 30 inches of rain fell in two months.